Ionic gold is what some producers call their non-colloidal gold supplements. Monatomic gold is another name some companies call their ionic gold products. Ionic gold is a water soluble gold salt that is dissolved in water. The gold salt must be water soluble to create an ionic solution. Laboratory testing of products labeled as ionic gold has determined they are really gold chloride, also called Chlorauric acid, a water soluble gold salt. Some producers trying to avoid the stigma of gold chloride have claimed that their ionic gold is gold hydroxide. Gold hydroxide is a gold salt which is not water soluble, making the claim scientifically impossible! For more details on ionic solubility see Solubility Rules. The chloride test described below demonstrates that products claimed to be ionic gold and gold hydroxide are really gold chloride. It is interesting to note that you will never see gold chloride on the label of these products, a violation of the federal laws governing labeling. The reason you don't see gold chloride on the label or mentioned in the ads is because gold chloride is known to be potentially toxic to humans. Gold chloride is a neurotoxin. Definition: A neurotoxin is a toxic agent or substance that inhibits, damages or destroys the tissues of the nervous system, especially neurons, the conducting cells of your body's central nervous system. Gold chloride is known to cause Peripheral Neuropathy. Peripheral neuropathy describes damage to the peripheral nerves, the vast communications network that transmits information from the brain and spinal cord to every other part of the body. Among the many the causes of peripheral neuropathy are neurotoxins such as gold chloride, they produce common symptoms including weakness, numbness, paresthesia (abnormal sensations such as burning, tickling, pricking or tingling) and pain in the arms, hands, legs and/or feet. A large number of cases are of unknown cause. A metal ion is an atom that is missing one or more of its orbital electrons giving it a positive ionic charge. Because these ions are attracted to the cathode in an electrophoresis cell they are referred to as cathode ions, or cations. Likewise, ions that have a negative charge are attracted to the anode in an electrophoresis cell and are called anode ions, or anions. When metal cations are present in a solution the positive charge of the cation must be offset by a corresponding negative charge from a companion anion. Therefore, whenever cations are present, anions must also be present in the solution. This always results in solution whose net charge is zero. Ionic gold is a solution containing gold cations along with companion anions. An ionic gold solution is formed when a water soluble gold salt is dissolved in water. Ionic gold is not the same as metallic gold. For example, metallic gold is not water soluble (does not dissolve in water) but ionic gold is water soluble (it does dissolve in water). Technically speaking, a gold ion is an atom of gold that is typically missing three electrons and is referred to as Au+3 or Gold(III). It is the outermost electrons of an atom that determine the physical properties of matter. Take away three electrons from a gold atom and you get a gold ion which is water soluble. In its ionic form, gold will react with other elements which means it will combine to form compounds.Conversely, metallic gold does not readily combine with other elements. An ionic gold solution always contains gold cations along with companion anions. If the water were evaporated, the gold cations are forced to combine with the anions to form a gold compound (salt). Clearly this gold compound must be water soluble. There are a limited number of gold compounds that are water soluble. Gold chloride is the most prevalent water soluble gold compound because it is easier to produce than the others. If the anion in an ionic gold solution is not specified it is reasonable to suspect that it is gold chloride. To prove that the solution is gold chloride simply requires proof that the cation is gold and the anion is chloride. The gold cation can be measured using atomic absorption/emission techniques or by using an ion selective electrode (ISE). Either test requires equipment available in many testing laboratories. Assuming that the presence of the gold cation has been determined, then only a qualitative test for chloride is needed. Simple test for chloride - This simple test for chloride will indicate if products labeled as ionic gold are really gold chloride. Put a small sample of the ionic gold solution in a clear glass and add one drop of a 1% silver nitrate solution. The presence of chloride is indicated by the formation of a white cloud in the liquid. The white cloud is silver chloride, an insoluble salt which is formed when silver ions combine with chloride ions. 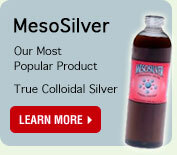 The formation of silver chloride proves that the solution being tested is gold chloride. All of the ionic gold products which have been tested by the Colloidal Science Laboratory, Inc. have proven to be gold chloride. An internet search engine can readily find a Material Safety Data Sheet (MSDS) for gold chloride which will show a heading called Health Hazard Data, under which it says: Ingestion - Seek immediate medical attention. Here is an MSDS for gold chloride. It is easy to understand why ionic gold products are not truthfully labeled to indicate that they really contain gold chloride. Interestingly, these are the same companies that twist the truth by deceptively claiming that ionic gold is safe and colloidal gold is toxic but they do not provide any evidence to support their statement. For those who are interested in the more technical aspects and want to understand the technical terms involved, see the extensive Definition of Terms. Why are so many gold supplement products ionic gold? The fact is that ionic gold is incredible simple to make. Products being sold as ionic gold are really gold chloride. Gold chloride is a water soluble gold salt which means that a gold chloride solution can be made by simply dissolving gold chloride in water. It is about as hard to do as dissolving a lump of sugar in a glass of water. This is so simple that a ten year old could do it. This is not to say that all producers of ionic gold solutions make their product this way, only that it could be made this way. Another way to make the same product is to dissolve metallic gold in an acid solution called Aqua Regia. Agua Regia is a mixture of hydrochloric acid and nitric acid. Once the metal is dissolved, the solution is subjected to a high concentration of ozone which oxidizes the remaining acid leaving only the gold cations and the chloride anions in solution. Many ionic metal solutions sold for use as dietary supplements are made using this method. Ionic solutions containing different metal cations and different anions can be made by simply using different acids and different metals. It means that products advertised as ionic gold are really gold chloride and that gold chloride should not be used as a dietary supplement because it is a potentially dangerous substance. For a truly safe gold dietary supplement which contains no gold ions the only choice is a high quality true colloidal gold supplement consisting of metallic gold nanoparticles.